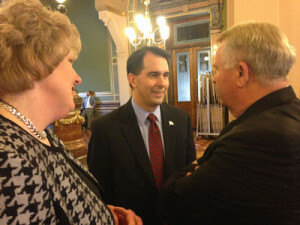 Scott Walker speaks with State Rep. Mary Ann Hanusa & Iowa Western Community College President Dan Kinney during a recent stop in the state. The latest Quinnipiac University poll shows Wisconsin Governor Scott Walker has a strong lead among the field of competitors for the GOP’s 2016 presidential nomination. “He’s obviously won the fresh face award,” says Peter Brown, assistant director of the poll. Walker, who has not officially entered the race yet, had the support of 21 percent of likely Iowa Caucus-goers who were questioned over an 11-day period that ended on Monday. The poll found a “four-way scramble for second place” among Kentucky Senator Rand Paul, Florida Senator Marco Rubio, Texas Senator Ted Cruz and former Arkansas Governor Mike Huckabee — all of whom are declared candidates. “The four of them are roughly even,” Brown says. Huckabee won Iowa’s 2008 Caucuses, Rand Paul helped his father campaign for president here in 2012 and Cruz gained national notice almost as soon as he joined the U.S. Senate in 2013. Rubio barely registered in Quinnipiac’s February survey of Iowa Caucus-goers, but Brown says Rubio got a bounce in Iowa from the events he held to formally enter the race in mid-April. “There seems to be a yearning within the Republicans for a new candidate, a new persona for the party,” Brown says. Former Florida Governor Jeb Bush leads or is among the leaders in national polls, but Bush registered just five percent support in Quinnipiac’s survey — a seventh place position among the pack of GOP presidential hopefuls. Brown says 45 percent of those surveyed said Bush was not conservative enough. Twenty-five percent of those surveyed said they would definitely not support Bush and 20 percent said they would not vote for New Jersey Governor Chris Christie either. The poll has a margin of error of 3.8 percent.